It has been a very mild Autumn so far. Today, temperatures rose over 15 oC. A butterfly fluttered over my head. I thought it could be a Red Admiral. 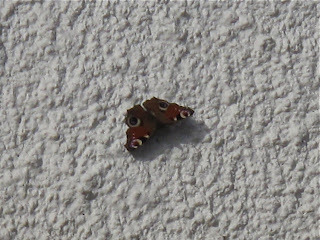 Fortunately, it settled to sunbathe on a white, south facing wall, and using my camera telephoto I was able to take a picture and identify it as a Peacock. It is the latest active Peacock I have seen since I started to record butterflies in 2003. 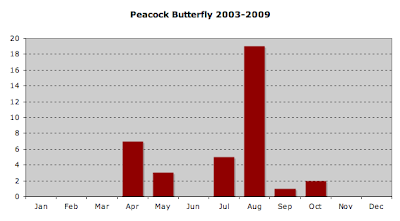 This is the usual phenology of Peacocks in my grid square (TA0830). A single brooded species, adults break hibernation in April, breed, and the next generation is on the wing in July. Butterflies usually start hibernation in early September.